There is just something about the taste of that Marsala wine and the tenderness of the mushrooms that makes my mouth tingle. When I came across this recipe I beamed. 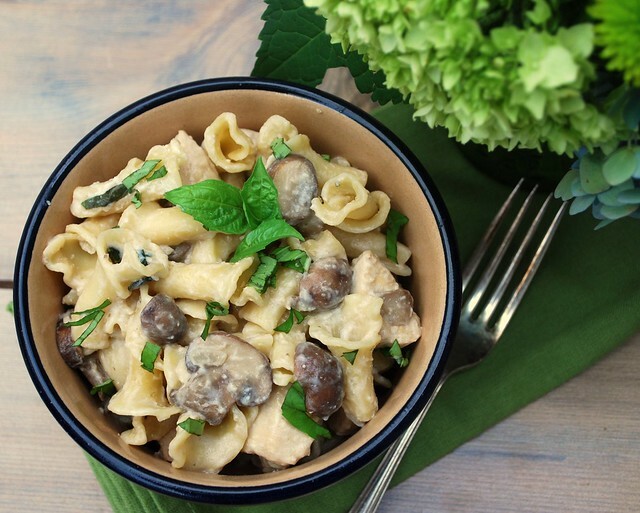 Chicken Marsala mixed with pasta? Be still my heart. I found this recipe on What's Cookin Chicago. Joelen has lots of great recipes, but this one grabbed me and made me make it. Recipes do that you know? I served this to friends last week and they LOVED it. It's a keeper! I did change things up a bit, like I always do. Not too terribly much though. Season the chicken with salt & pepper. Cook the chicken in a large skillet with about 2 tablespoons of olive oil. Transfer to plate when done. Boil the water and cook pasta until al dente. While the water is boiling add another 2 tablespoons of olive oil to the pan then add the garlic, mushrooms and onions. Cook for 10 – 15 minutes. Put the cooked chicken back into the skillet. Add the Marsala, chicken broth and half & half. Bring to a boil then lower to a simmer. Cook until sauce has thickened. About 3 – 5 minutes. Drain the pasta and reserve ½ cup of the cooking water. Add the pasta to the same skillet and add in ½ cup of Parmesan & the chopped basil. Cook until the pasta has absorbed some of the sauce (about 1 minute). Add in reserved cooking water if needed. Season with salt, pepper and garnish with a sprinkling more of cheese. Last post I promised a giveaway of Trader Joe's Sugar Chocolate & Coffee Bean Grinder didn't I? I know not everyone lives near a TJ's. We've only had ours about a year and I love it. So many different and interesting items there, two of my faves being the Fleur de Sel Caramel Sauce and the Fig Butter. LOVE! But today we are talkin' about sugar that you grind, just like a salt grinder except delicious flakes of sugar goodness crackle down on your goodies. I sprinkled some on my Stuffed Strawberries, but I can imagine this on cakes, cupcakes, in your coffee, on your toast...endless possibilities that I want you to experience...so I'm giving away THREE grinders to three lucky people. 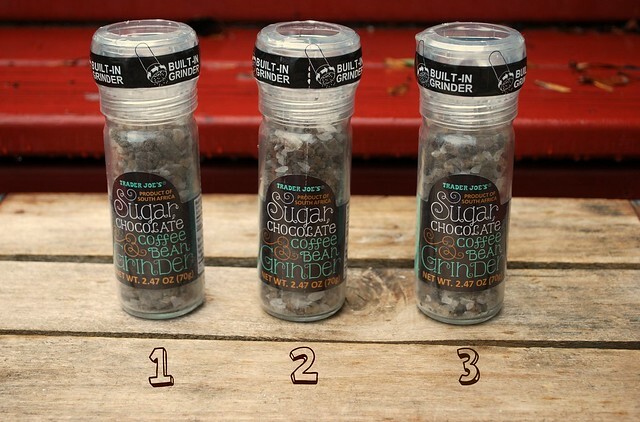 To win leave a comment......WHAT WOULD YOU SPRINKLE THIS CHOCOLATE SUGAR ON? I'll pick three winner on August 19th. If you don't have a blog.....LEAVE AN EMAIL ADDRESS so I can get in touch with you please. If you blog or Facebook this giveaway let me know and I'll throw an extra chance in for ya. I can't think of what I would sprinkle this one besides the obvious, more chocolate, but my daughter will put it on EVERYTHING. That Astaire looks delicious! I have to make it. I think I would sprinkle it on ice cream. I would put it on hot chocolate, ice cream and brownies! I would like to try this on top of vanilla ice cream. YUM! I'm thinking this would be awesome on top of the cream cheese on my bagel !!! 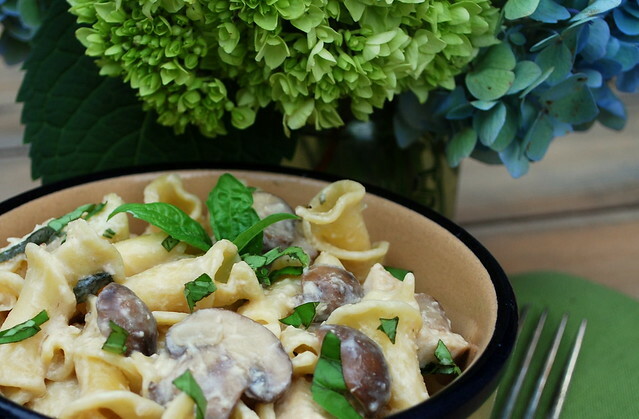 And I shared your link on my FB page AND I've added your recipe for Creamy Chicken Marsala to my Pinterest! Hmmm... I'd sprinkle it on toast, ice cream, yogurt, strawberries, maybe even my toothpaste! I would sprinkle it on my tongue. Are you kidding? I want a Trader Joes. I want this. And I want that pasta. Big time. I will sprinkle it on ice creams...and chicken looks yummy. There are so many things I could sprinkle this on such as pancakes, waffles, cupcakes, ice cream, I could go on and on. on top of chocolate cupcakes with cream cheese frosting. I'd like to try it on French toast instead of powdered sugar. Thank you! I'd put it on ice cream and cake/ cupcakes for sure. And I definitely want to try out those strawberries soon! Probably toast and I would also use it to make some yummy cookies! On top of peach ice cream, red velvet cake, and the top of my hand! But first, I'd open the top, close my eyes, inhale, and smile. I sprinkle it on my coffee - yum...would also be good on some vanilla ice cream. However, don't pick me because I live very close to a TJ's, and not that i wouldn't want them, but I would love for someone who doesn't live near one to be so lucky:-)....so they can just understand the greatness of TJ's like we do! Plus I picked these up the moment I saw them. I also got some of the African Smoke which was great. This pasta is amazing. I love Marsala, too and I used to order it every single time I saw it on the menu. This is brilliant and I am so going to make it. I would sprinkle it on vanilla bean ice cream. Yummmm. I just had a friend send me a link to your blog and I'm so glad she did! This recipes look delish!! I would sprinkle it on ice cream...yum! On anything and everything ;-) And "no" we don't have a TJ's anywhere near Tularosa, NM. Coffee is one of my favorite things so I would be putting this on everything and anything :) Could you imagine chocolate cupcakes with mocha frosting and this sprinkled on top? We don't live anywhere near a Trader Joe's so this would be wonderful! I would sprinkle it on top of custard, ice cream cookies before baking. I think this would be awesome on just about anything. Waffles, ice cream, fruit, ice coffee with whip cream!!!!! I'd make some rice pudding and sprinkle it on there. NOM! This sounds soo good! I can imagine it on home-baked bread toasted with a little butter and a big cup of french press coffee! Heaven! Wish we had Trader Joe's here in Idaho but we don't. I miss it. I once made strawberry cheese blintzes - like in IHOP - and I've been craving them recently. Chocolate sprinkles over strawberry blintzes? Sigh. It looks amazing…I don't eat chicken that much, but after seeing you dish and the snaps, I am totally hooked !